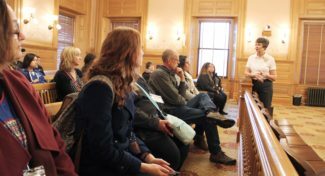 The entire Newman University freshman class traveled to Topeka, Kansas, Thursday, Nov. 8, to visit three locations: The Ritchie House, Brown vs. Board of Education (BOE) and the state capitol. 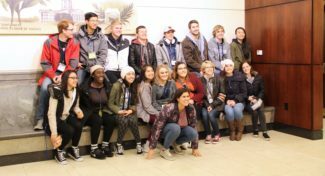 This was the first time an entire freshman class traveled together on a field trip of this nature — and staff and faculty agreed it was a great experience. During the summer before their freshman year, all incoming students read “The Immortal 10: A Story from the Kansas Underground Railroad” as a common reading for their Traditions and Transitions (T&T) classes. Rosemary Niedens, associate vice president for academic affairs, said she wanted to give the students a chance to see part of the underground railroad history in person, adding that she wanted the students to experience that historical timeline to current day. “The Ritchie House was the key location for the Topeka field trip,” explained Niedens. “At the house, students could see for themselves the location where slaves were hidden for safety on the Underground Railroad. It allowed the students to see the conditions in which runaways were smuggled, to stand where those individuals stood 150 years ago. The freshman students seemed to all have a common takeaway when asked about the field trip: making new friends and bonding with peers they already share classes with. Students pose in the state capitol lobby. Schwarts said getting to know his classmates wasn’t the only thing he will take away from the trip. He said visiting the capitol was a great experience, one he hadn’t had since he was a child. 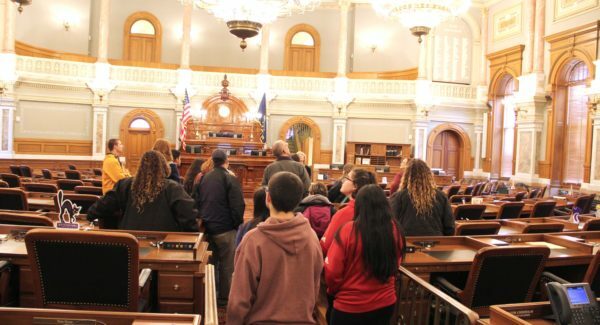 Students and faculty learn about the history of the Kansas state capitol Supreme Court room. Sommer added that the trip added to the great experience she is getting from her T&T class. The trip was such a success that faculty members said they are already thinking about next year.